You know, of course, I perform exhaustive searches of the interwebs each week to bring you guys news you may not find anywhere else. I guess it's my training from a previous career. When I was on-air at an all news radio network in the late 70s, while other announcers interviewed politicians and celebrities, my research for interview subjects consisted of the National Enquirer and similar high-brow print media sources. Made for great radio. I would have loved to have interviewed this guy. Seems an ambulance was called to a 63 year-old Glendale, California man's house after he had attempted surgery on himself. Yep. Apparently he had become upset with a hernia he had and decided he was going to take it out himself. You know, given rising health care costs I kind of understand his thinking. But this guy obviously isn't the sharpest knife in the drawer. Nor did he use the sharpest knife in the drawer. Paramedics arrived to find a butter knife protruding from the gentleman's stomach. Not a butcher knife, not a steak knife, not even a ginsu knife - hell those things can cut through anything. Special hernia kit - as seen on TV. Ima Carver (not his real name) was taken to hospital and placed under psychiatric care. Lika Surgeon (not HIS real name) at Glendale General Hospital commented he thought Mr. Carver was a real cut-up; "a guy who lived life on the edge," he said bluntly. Surgeon said it could have been worse. "He could have used the butter knife to "spread" his surgical efforts to other parts of his body. Thank goodness he couldn't "handle" it." Authorities say they'll keep a sharp eye on Mr. Carver. 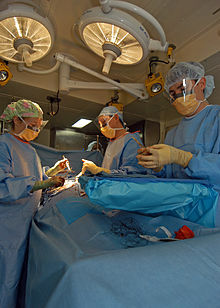 Leave hernia surgery to the professionals. There's no better way - any way you slice it. holy crap. people never cease to amaze me - but what the hell would ever posses "Ima Carver" to try and take care of his hernia at home, with a butter knife? That's completely insane. After his surgery, they might want to check him into a mental hospital! Kinda makes you wonder what they're putting in margarine these days. Holy cow, Dufus! Talk about a bloody knucklehead! Oh, yeah. Don't you just love this stuff.You know, stupid people stories? I can't get enough. You know, there's a commercial that used to run here in Canada that shows a doctor explaining a medical procedure over the phone. It cuts to a guy on the other end of the phone with a knife in his hand and he says "Doc, shouldn't you be doing this?" I can't remember what the ad was for, but "Ima Carver" sure reminded me of it. I think this guy looked down at his stomach and said "I can't believe it's not butter!" Well a bloody stomach anyway. I think a bloody knucklehead would have been after he performed brain surgery on himself. You know, I was trying to work that line into my comment but I couldn't really think of anything overly - or even partially - witty. It's gotta be the heat. I'm not butter. I'm not margarine. But I know that I'm melting (or at least my brain is). Ha! Sadly (or, maybe not so much) I'm old enough to remember that commercial. By the by, did you know that margarine is one molecule away from a plastic? 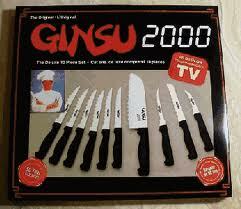 Nothing to do with the story, but I've ALWAYS wanted a set of those GINSU knives! Oh yeah, those knives would cut through anything from concrete blocks to hernias. In a sick & twisted kinda way! I hear he was a real cut up around the plant. A cut up. A real cut up. Ok, ok, you don't have to be so blunt about it. Blunt. Blunt about it. Hey, it's just how I operate. Barrump-bump - I'm here all week. Hey. Wait. Were you in that movie Face/Off? And you collected the Enquirer news quality news items? I knew there was a reason I like you! Hard to break bad habits, I guess. You know I used to think The National Enquirer and the Globe and others made up those stories, or at least embellished them. But when I tracked down the people in those stories I found out they were true. Stupid, maybe, but true!